Nice! Thanks for the dedication. The role-play of 'sacrificing' makes it more fun, huh. Or not. 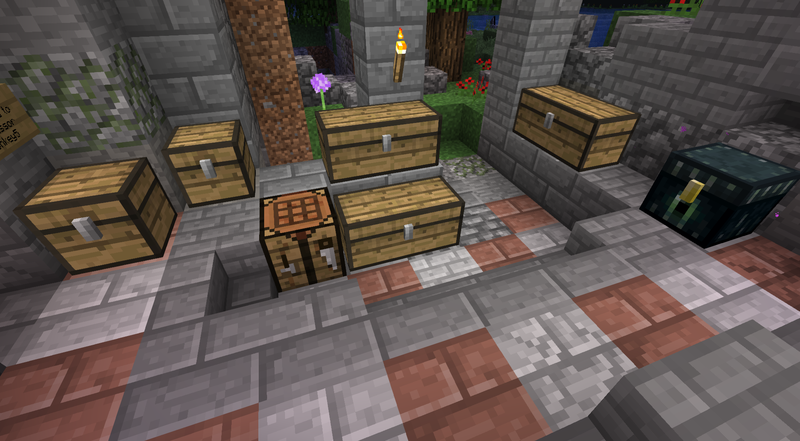 That would get in the way of chest access I suppose, unless you had 2 blocks rigged to pistons. Oh, I see! I have yet to master both how water works and double piston extension! If I can widen it again, I do think it will look better. 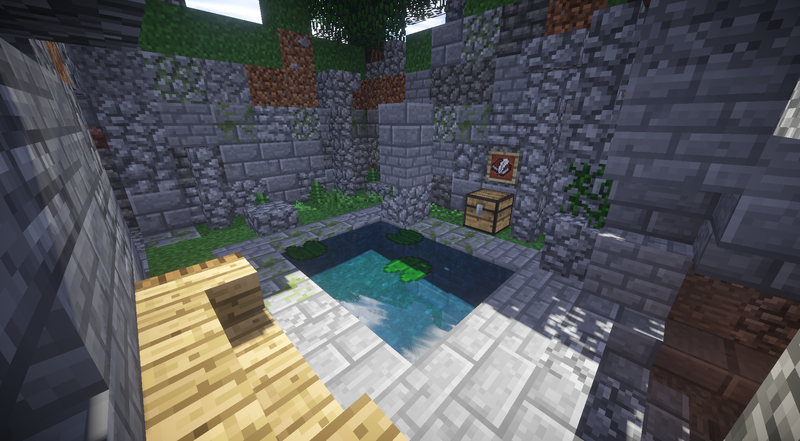 I also thought the pool could be even better with the dispenser more hidden, one block back and one block higher, so I might implement that together with a double piston extension to really make the build more mysterious. The name Adversity made me associate to struggle. Even if the theme of Flower Valley is peaceful, the ruins come from another time, a distant past and so includes an arena where fierce battles have taken place. 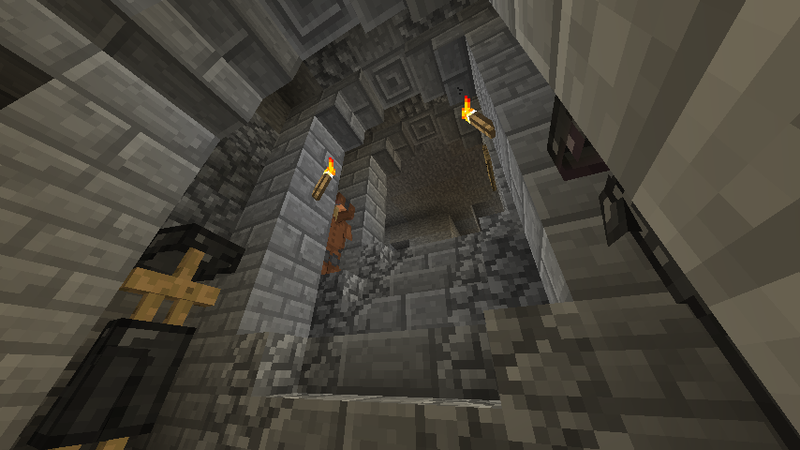 I then hollow out a large room, 13 by 13 blocks wide and deep, and 4 blocks high. 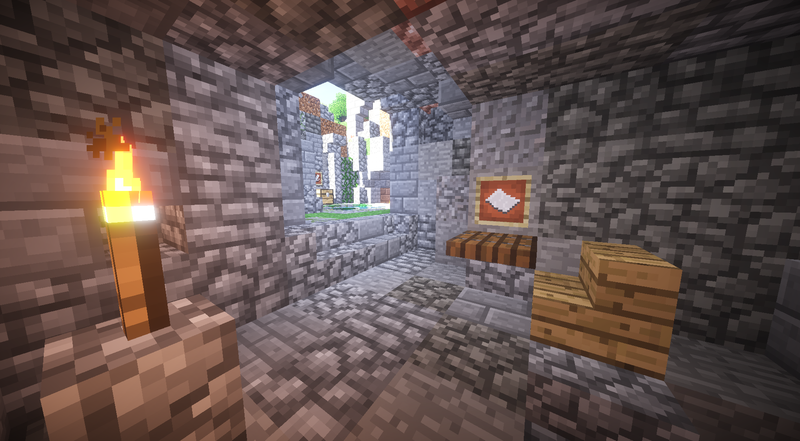 I use the general ruin palette for the floor, walls and ceiling; a mix of cobblestone, andesite, smooth stone, cracked stone brick and stone brick. Occasionally I add granite. 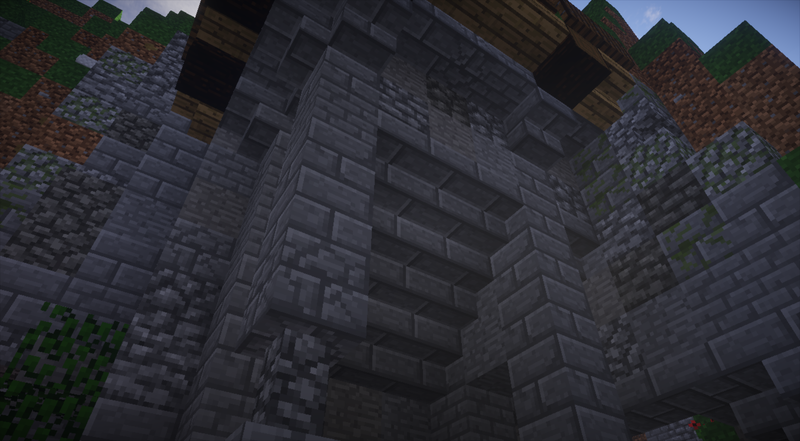 Slabs and staircase blocks create holes as if the structure has eroded and collapsed. In the middle of the room I create a one block deep shape, the fighting pit. To give its floor a gritty, violent look I mix cobblestone, granite, hay bales and soul sand. 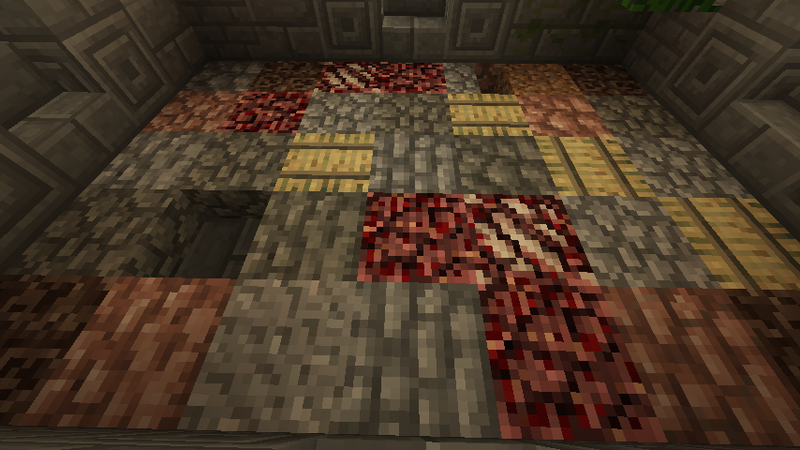 I use nether-rack and nether-rack with quartz to give the resemblance of blood stains and bones. 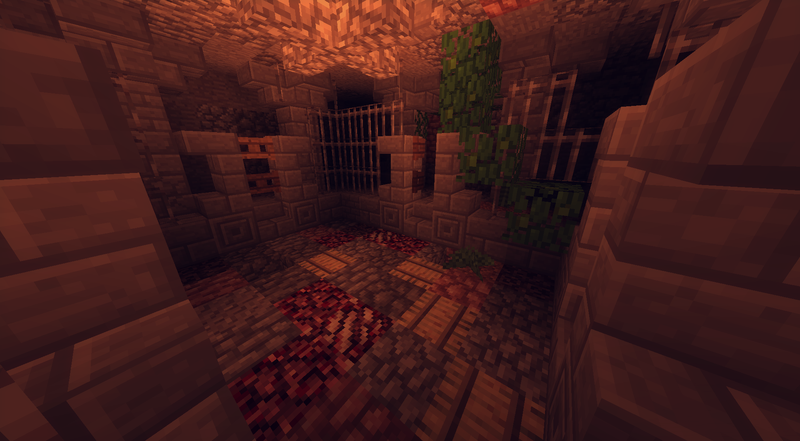 I surround the pit with iron bars, stone brick and fence doors and build support pillars made of stone blocks around the room to create a claustrophobic feeling. 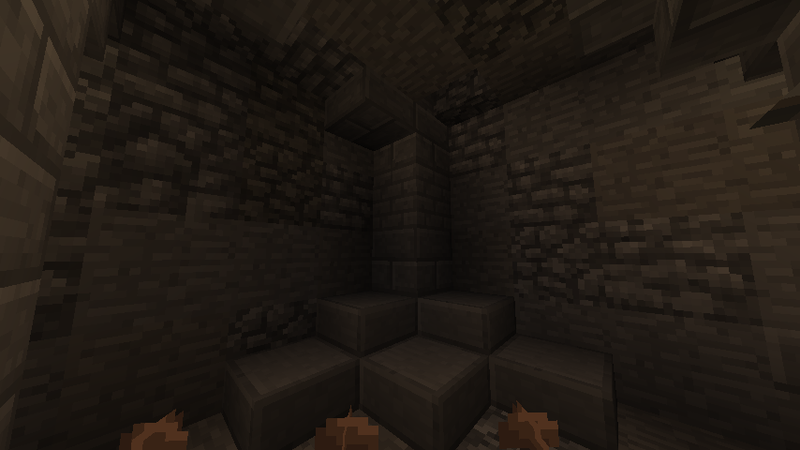 In each corner of the room I build up triangular shapes with stone slabs. I imagine part of the audience sat here to watch the battles. In the ceiling I hang a wooden chandelier with torches. As it is the only light source in the room, the focus is on the pit, corners remaining obscure. Above the end of the room a pond outside cause the ceiling to drip. This fits with the idea of an abandoned place so I embellish that area with vines, mossy cobble and stone, ferns and mushrooms. For more inspiration I read old posts where Adversity writes about horses, wanting to have this and that related to them. 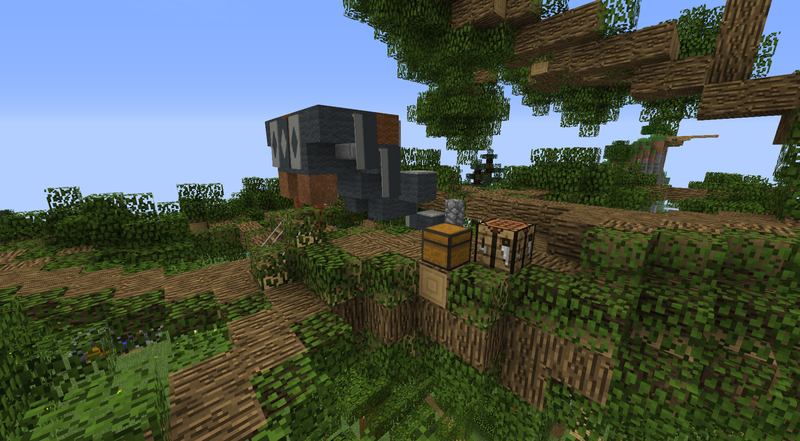 I place chests with the horse armor in three tiers along with saddles in the humid area. These might have been the price for the victors in the pit or others betting on the winner. The result is atmospheric, and frankly it gives me the creeps whenever I go down there. 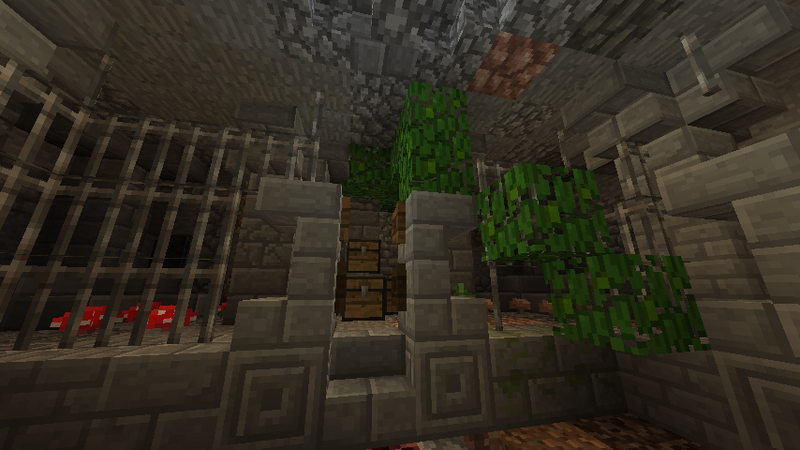 I even saw a creeper hiding behind a pillar. It is not a safe place outside of peaceful difficulty. We need some fresh air after this, so instead of taking one of the remaining options at the crossing, we scurry back outside and climb to the top of the hill. Dawwwwwwww!!! Thanks for the dedication! It all looks fabulous! I love how you use leaves in different locations. I would never think of that! 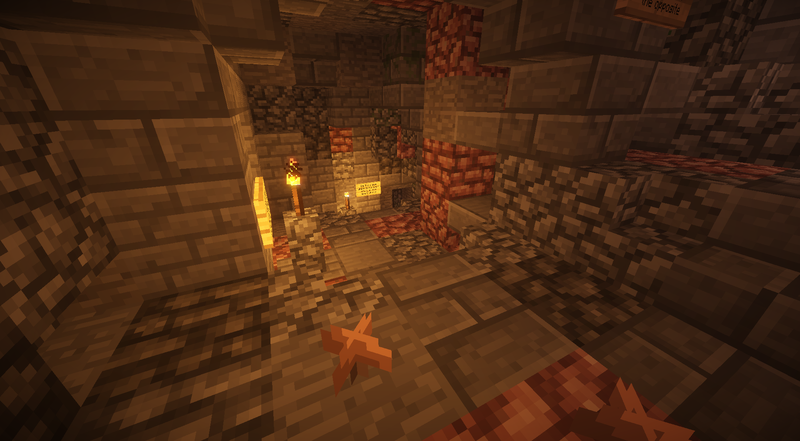 Have you thought about using red nether brick for the floor of the arena? It's a very striking color and honestly reminds me of bloodstained stone. I agree that we need some fresh air. I prefer topside life. Being in caves by myself makes me too nervous. Looking forward to the hilltop! Nether brick for bloodstained stone, that's a great idea! 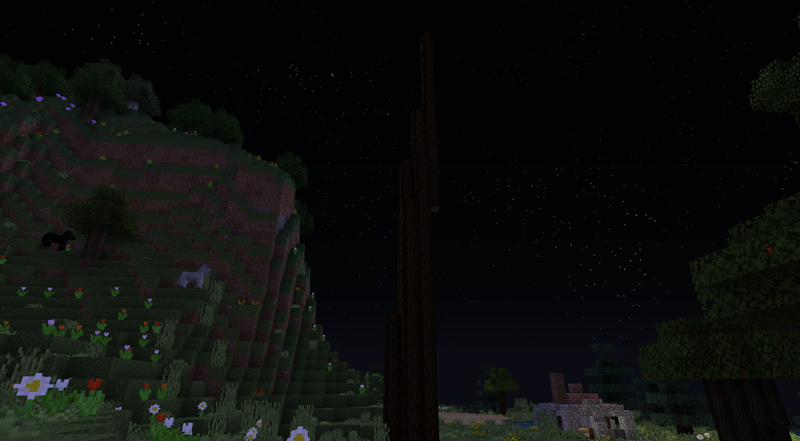 In the resource pack I mostly use, the nether brick texture is black (you will definitely notice it in tomorrow's post). I updated the title post to include a link and description of it, thanks for bringing this to my mind. The pack is so subtle that I often forget I am using it. It is made by Bdouble0100, who has inspired and influenced me a lot. 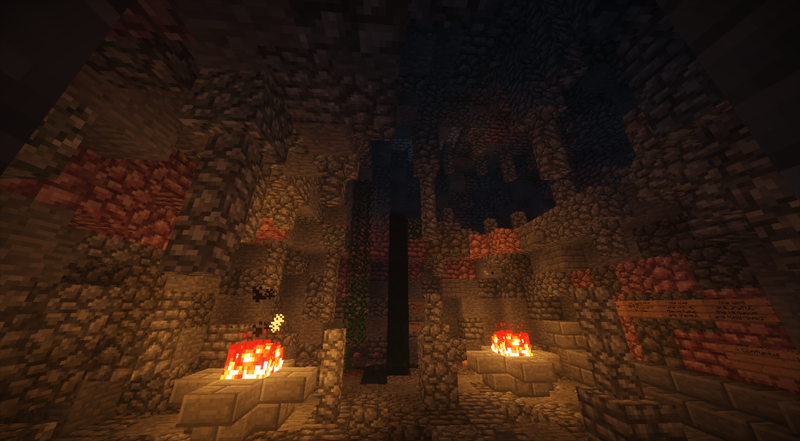 He changed nether brick to black to have a complete (full+half-slab+stairs) set of blocks in a more versatile color. I think I still could make nether brick work in both, I will give it a try! The name DraconLupus91 makes me think of dragons. Maybe Draco has another root, but I want to build a dragon! 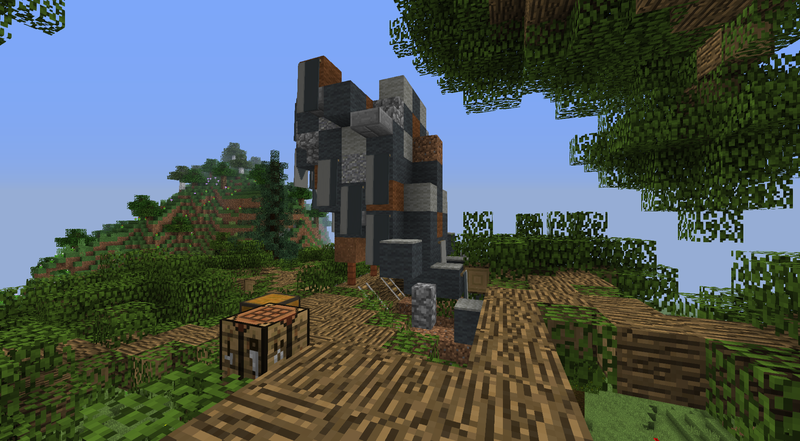 A dragon on top of the ruins might help it stand out and attract visitors of the valley to explore it. Is it a real dragon or a statue? Who knows? I clear the area on top of the hill and place a stone platform as a base. I build the dragon without references, choosing nether rack as the main material. 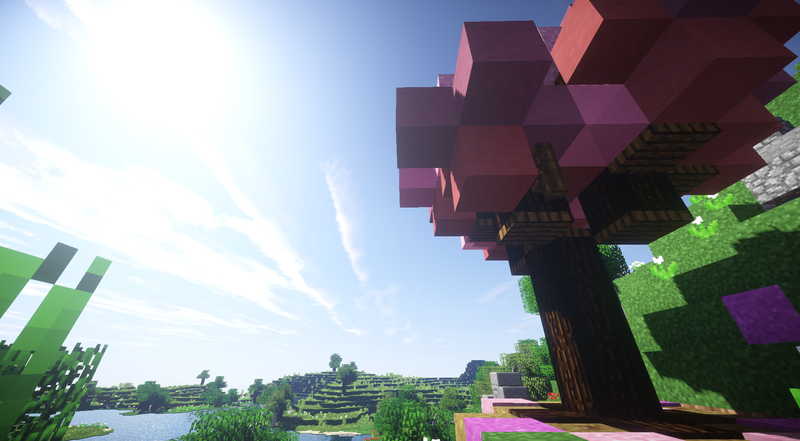 I think it will look good both in the texture pack I use where it is black as well as in the vanilla purple. For the wings I use leaves to make them seem thin and transparent. 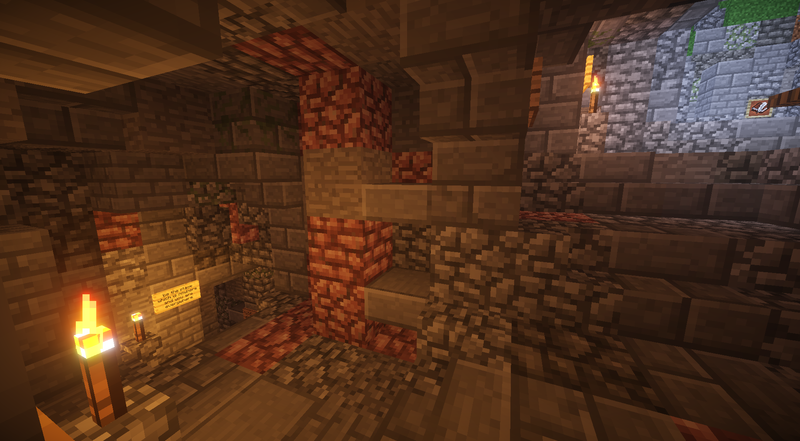 Magma blocks create a fiery breath. I also set fire to the surroundings using nether rack. Now there is something to behold! Ok, perhaps up close it looks just like a strange random jumble of blocks, but trust me, from down in the valley it is actually pretty life-like! Before getting into today's part of the Hub, which is short and sweet, let's have a quick look at what has been done more generally. The helmet and silk touch got mending! That is more time in the future spent building and less grinding for XP to repair! I also upgraded the chest plate from Protection III to Protection IV. 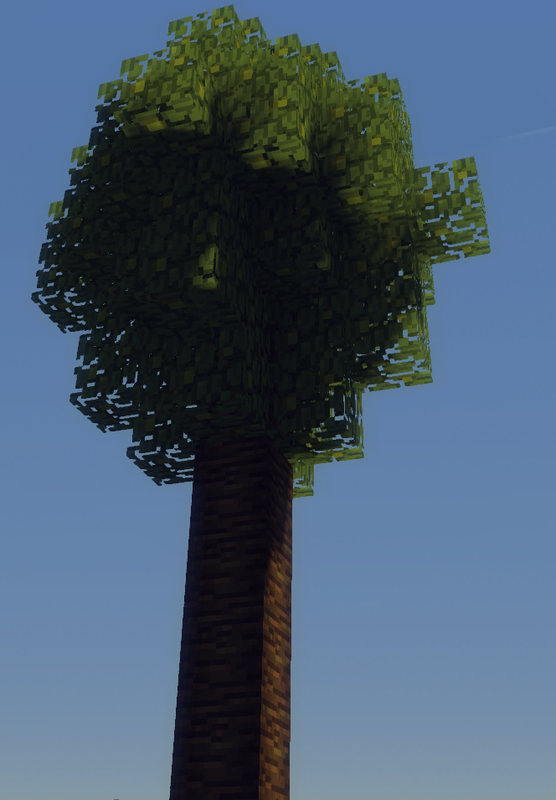 We got more custom trees built! About three of them for now. They will get their own post in a bit, I think we will need an intermission, since the Hub covers 11 posts! Featherblade; this name makes me think of the saying 'the the pen is mightier than the sword' (and pens as those ink pens made with feathers of course). I also adore this Minecraft poem that featherblade posted. It so happens that there is an area which suits perfectly for what I now have in mind; a place to sit and write poetry in. At the back of the ruin with a small pond is surrounded by dirt walls a few blocks wide. It also connects to a small descending cave. To add to the overgrown atmosphere, I mix in mossy cobblestone at the edges and ferns in the corners. Vines are hard to use without them getting out of hand; I try to limit their growth in an enclosure with fence posts, a pressure plate and a wooden button. I put written books in the chest for visitors, some with poems to read and some unwritten to write in. The poets need somewhere to sit and get a wooden bench along a wall and a chair further in the cave. 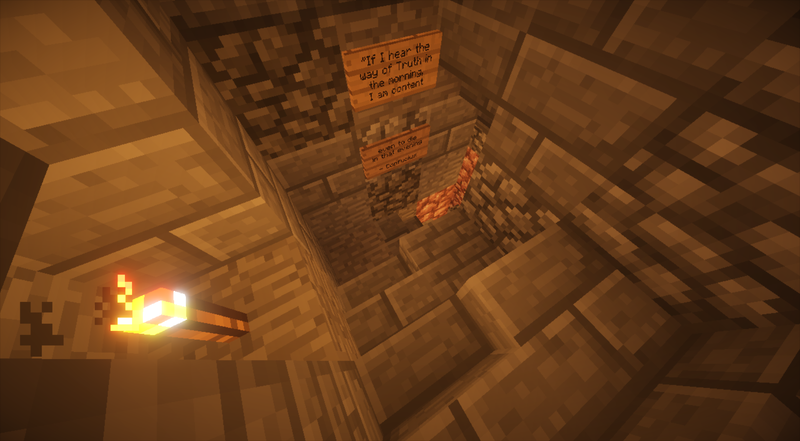 I add a poem on signs along the whole winding path down the cave while giving it the cobbly ruin treatment. At the end of the staircase, I make a small room with a seating area. Another really quite place to just sit and write. Back inside, it is time to climb the stairs to the upper level (but don't forget that we have two options left on the lower level). In all this ruin we need some fun! 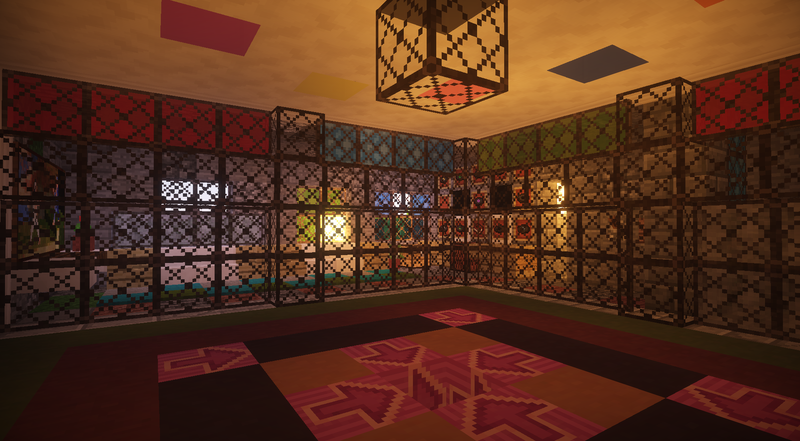 One of the builds I most enjoyed making in my creative world was a disco. I wanted to create an improved version! This one is be not just for players, but also for mobs =D. The upper level of the ruin has the space needed. 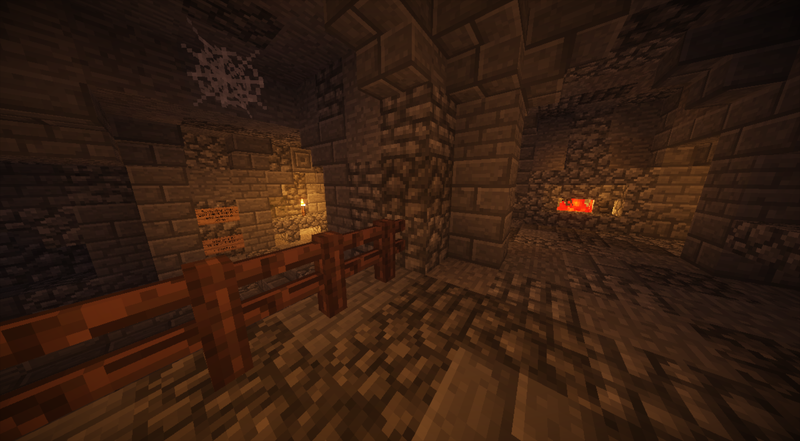 I had made a room earlier here, trying in vain to get skeletons to shoot creepers and give me music discs. Mostly I just blew up. Let's make a better party here! First, the music and disco light circuit. 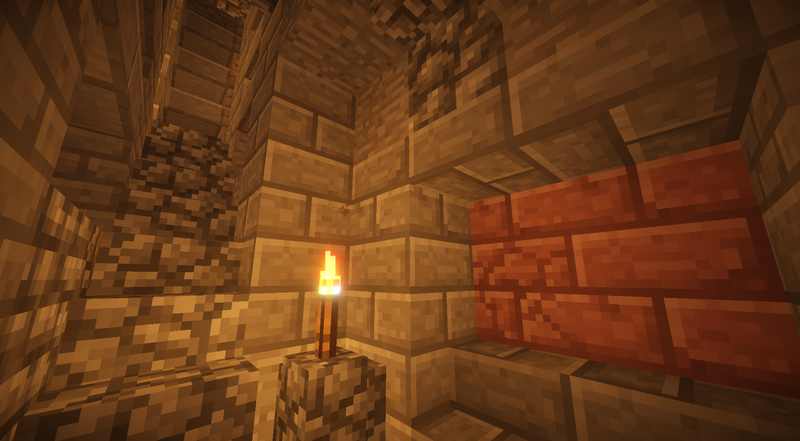 The room already has a space above the ceiling hollowed out for redstone lamps which we can use. 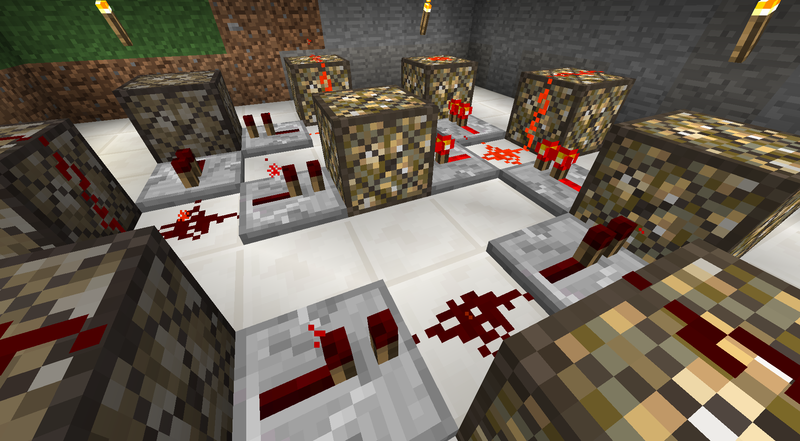 The old version of the circuit is improved by replacing my old idea with a simple hopper clock. I make circuit a symmetric circle with a one tick delay between eight lamps, leaving a center lamp permanently lit. 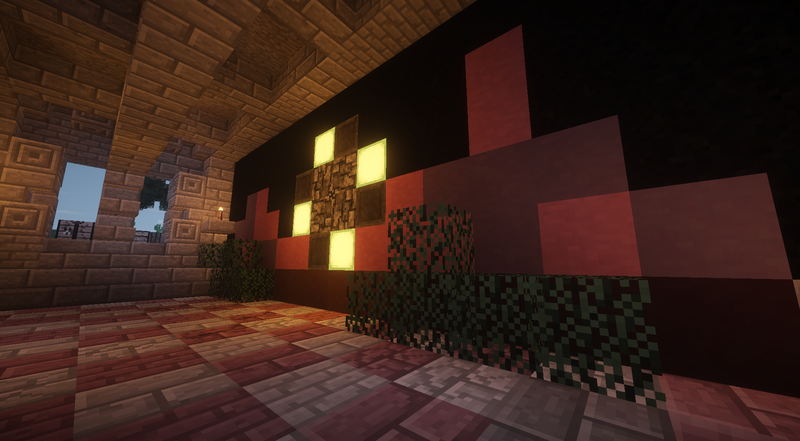 As in the old version I use stained glass to give the lights color, and quartz blocks as ceiling to keep a clear contrast. A jukebox in the disco below with a comparator and a torch tower in the wall behind is all that is needed to hook up the music to the disco light! When the music and disco lights are off, the mobs can spawn! We keep the ruin palette for the floor, walls and ceiling outside the dance floor to have contrast and so the change from the rest of the Hub is not too stark. The dance floor is 9 by 9, and I use dyed terracotta to make it colorful. I think the glazed terracotta with arrows is a perfect accentuation to imply dance moves! For fun, I make a hole in the middle where the loser or winner (depending on how you see it) of the dance competition can jump into. They will enter a water channel that flushes them all the way down to Adversity's Battle Arena. There is also a lounge area with soft carpets, glass windows and wide sofas to sit and watch the dancers in. 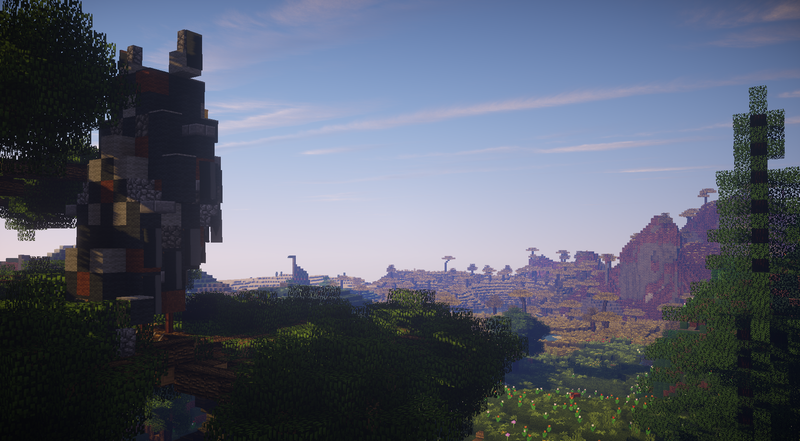 leangreen76's world has very large structures, at least compared to what I have built. So I dedicated the largest room, a long high hallway in the upper area of the Hub. This place was originally a natural cavern and what I had previously built here align very well with what leangreen76's bio inspires me to do; something in the style of the Inca culture! I had already dedicated one wall to the sun and day, and the other side to the moon and night. After googling images and reading on Wikipedia, I see that there actually are some famous Inca structures related to the sun and the moon. Even if they are gates and not walls I call it a fortunate coincidence! After reviewing what I built before I decide I want to start by improving the walls. They had the start of the idea, but the lower half of the walls are just plain smooth stone, and there are stairs in the middle of the hallway. I think I can do better. 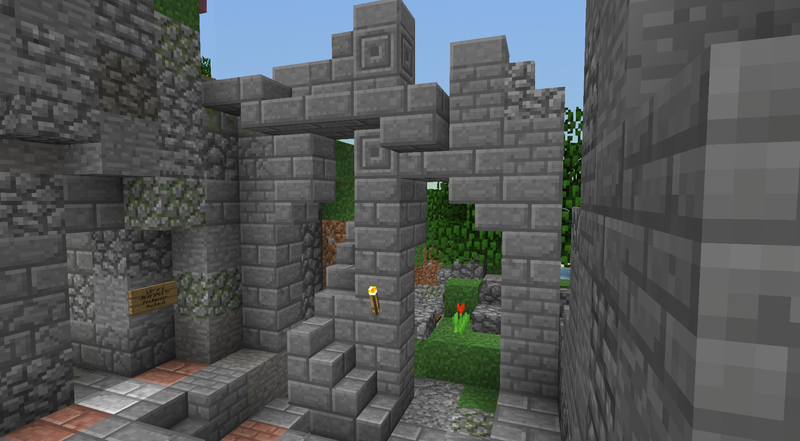 I retract the stone stairs to the end of the hall to emphasize the walls more, while keeping the floor pattern as I had before; a mix of diorite and granite. 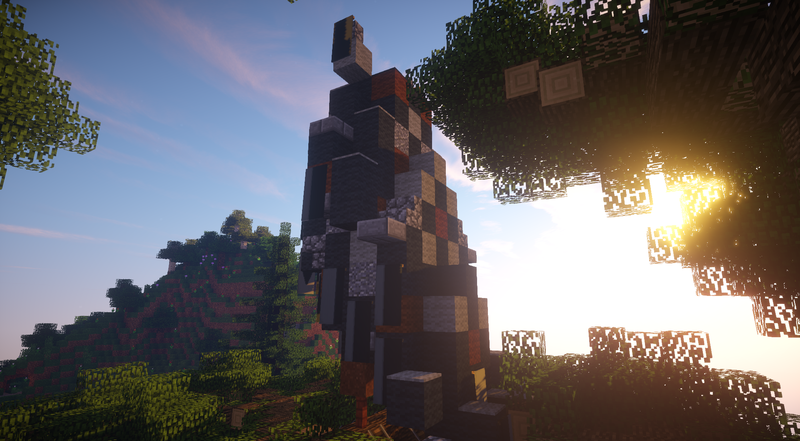 I use stained terracotta to make mirrored landscapes on each side, a blocky resemblance of sky, mountains and forest. 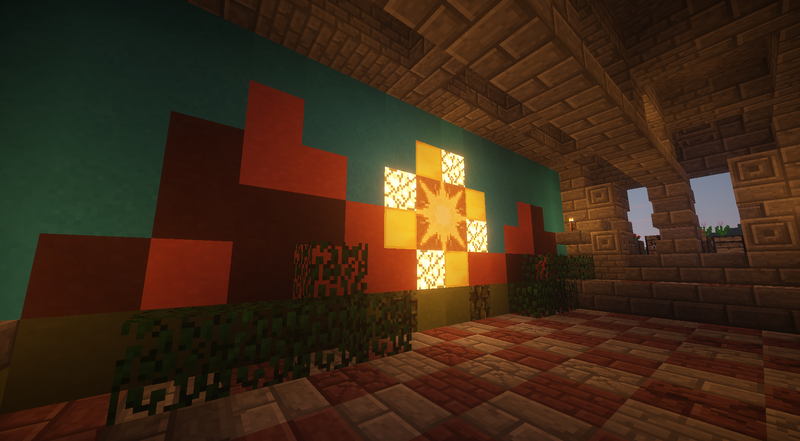 I use glazed terracotta for the center of the wall patterns representing the sun and the moon, surrounded by gold and iron blocks alternated with glowstone and sea lanterns to give light. 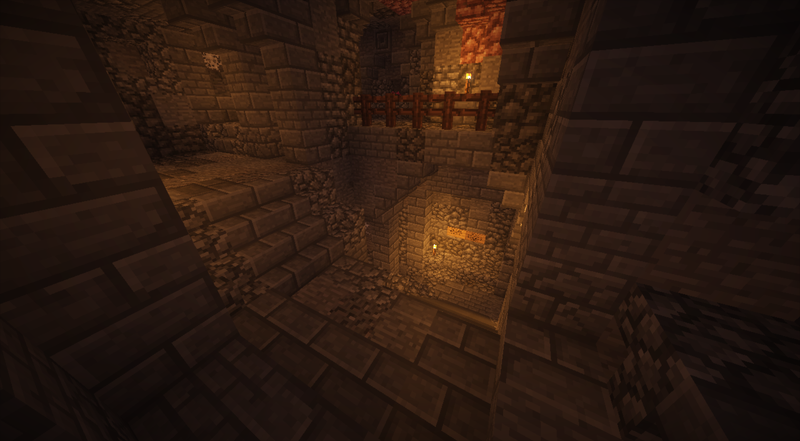 For additional lighting I place torches on stone brick slabs at the entrances and on a row of slabs lowered from the ceiling. 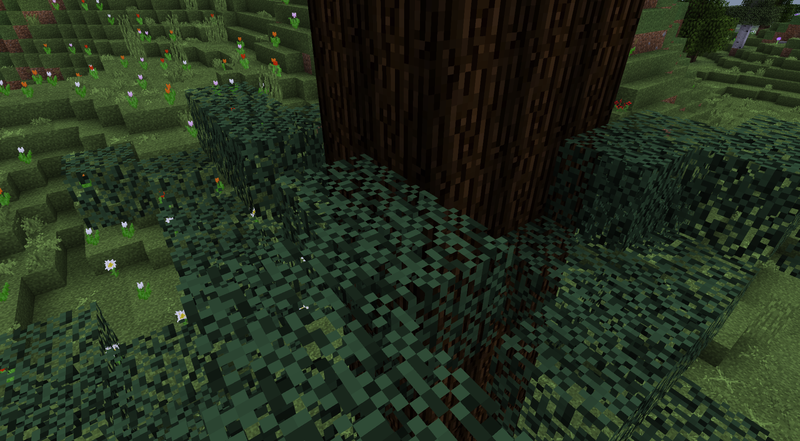 Oh, and I use leaves to make the forest stand out a bit. And also because I just can't live without leaves! The Incas were masters at combining stone masonry with natural shapes of the environment. Even if I don't have any natural outcrops to use here, I try my best to replicate some of their architectural expression. At the two ends of the hallway I make some curious gateways, remembering some impressions I caught of Inca architecture during my life. At the staircase, two options remain, besides going back down; up or directly to the right (east). Let's have an brief intermission between the Hub posts. 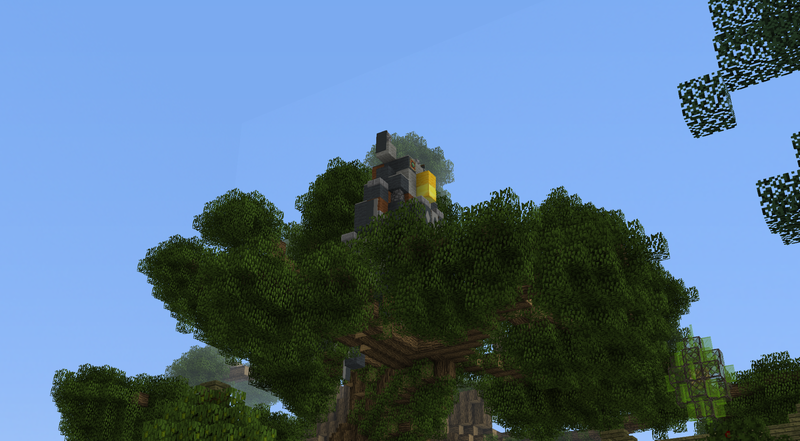 Something has landed in the Life Tree! Trying to sculpture a very complex creature was a lot of fun! 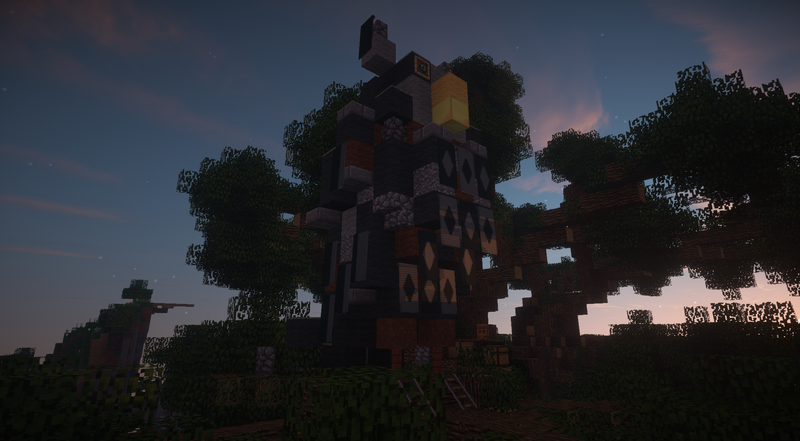 I did it in a creative world first, and then made a list of all the items needed to reconstruct it in the Life Tree. In total around 230 grey wool and 73 light grey wool to also make banners and carpets. A lot of running around breeding, coloring and shearing sheep! Baah! The first design I made looked like a square tower of random blocks more than an owl, but I gradually found ways to curve the body more. I sincerely wish I had some screenshots to show you how much the initial version differed compared to the final result, but sadly I don't. Something to keep in mind for the future! I was also only using wool until I remembered that banners exist!! I have barely used. They are a very new addition for me (consider that I have been playing since alpha). I think banners are perfect for adding a pattern to the owl's chest and also making it more feathery in general! 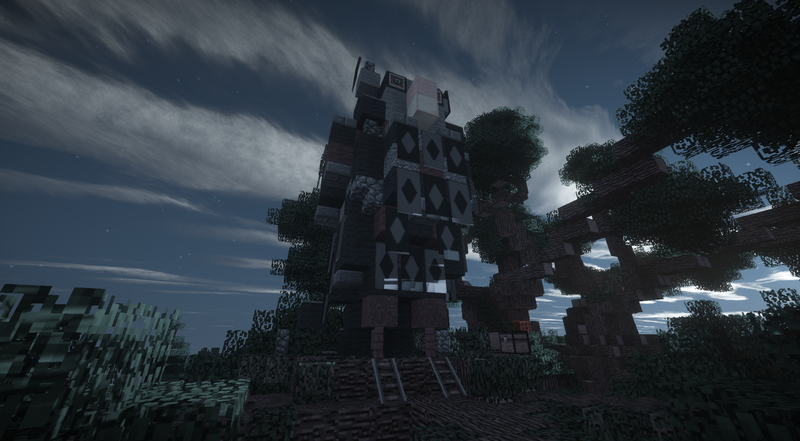 Here we can see where the owl is gazing at, it is watching the savanna north of Flower Valley. Will we build something there? To sum up: one of my favorite builds so far!! Thanks to Zabarion for this awesome suggestion!!! 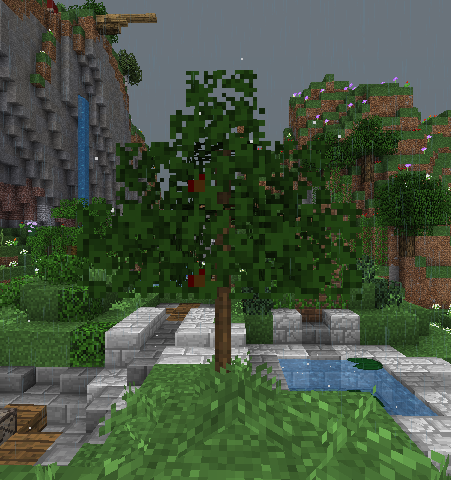 More additions to the Life Tree will come in a few days! That owl is amazing! I remember seeing you post about this in another forum. It looks amazing here! Great job! 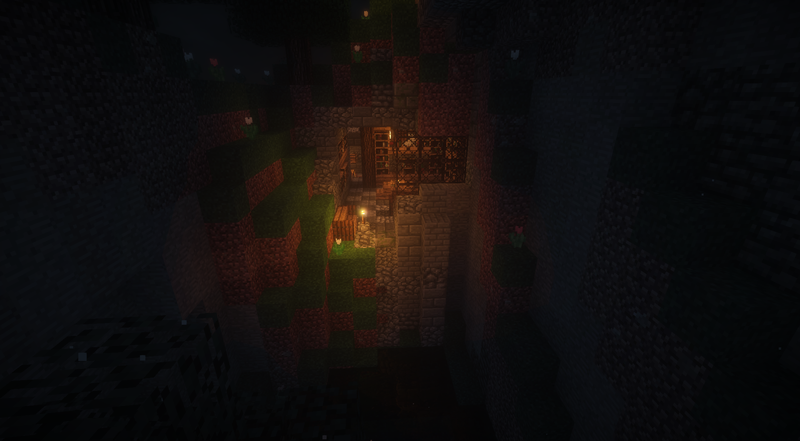 Let's continue with the Adventurer's Hub. I will post two updates today, and the last two on Saturday. All of them are a bit shorter than the previous ones. ProfessorMonkey5, I can't but think of the librarian in a certain famous fantasy novel series, can you guess which one? I know, the librarian there is not a monkey, but a great ape, but be kind to me! Oook! And I also associate professors with libraries, so building a library is a given. There is space to the east on the upper level in the ruins, below the disco, which will do. I start by hollowing out a 13 by 7 deep and wide room, 5 blocks high. This leads to the room being open in one end to the outdoors, but this is not a problem, the broken wall and ceiling just adds to the feeling of ruin. There is the channel from the disco to the battle arena here, which is a bit of a sore thumb. 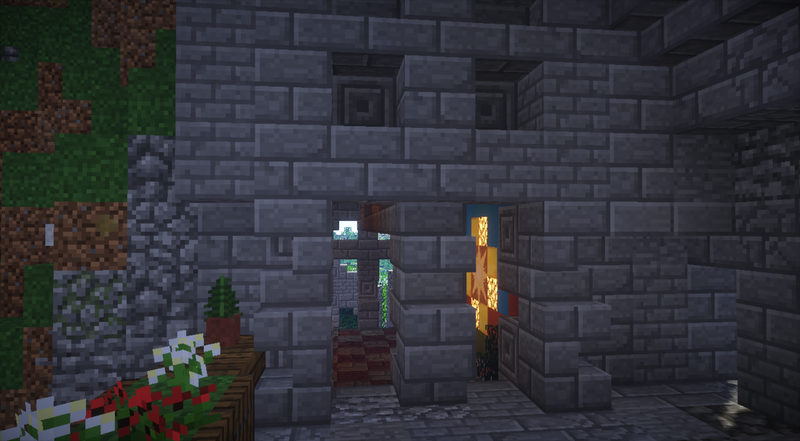 I enclose it in a thick glass structure..
Then I remember the stronghold library! Armed with axe and shears I go there for books, cobwebs and inspiration! I also take the chance to explore some uncharted territory to the north. But I discover mostly ocean, so I leave it for the next Minecraft update! What is your favorite addition? For me, I think dolphins and turtles. A mob that gives a drop without having to kill it, that make me so happy! 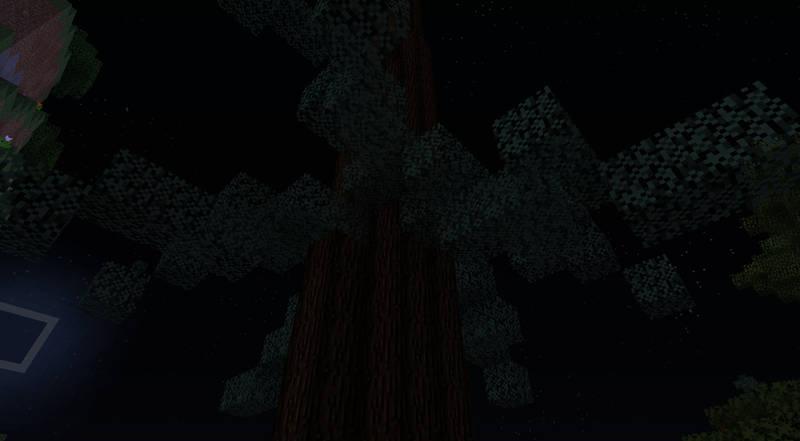 Also bark, that's perfect for us custom tree builders! Back again, I remove almost everything I built. The bookshelves in the middle of the room made the space very cramped and limited all the options. Instead I set the shelves into the walls. Now the floor displays its checkered pattern and there is space in the middle to work with! 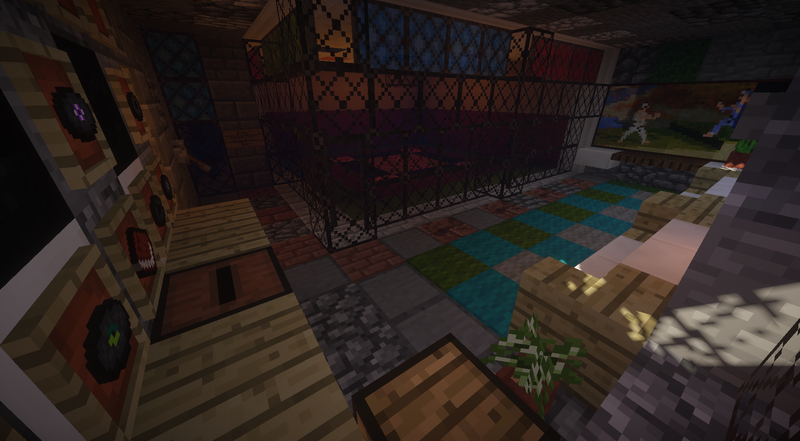 I place chairs surrounding an enchantment table and a more elaborate lamp in the ceiling. 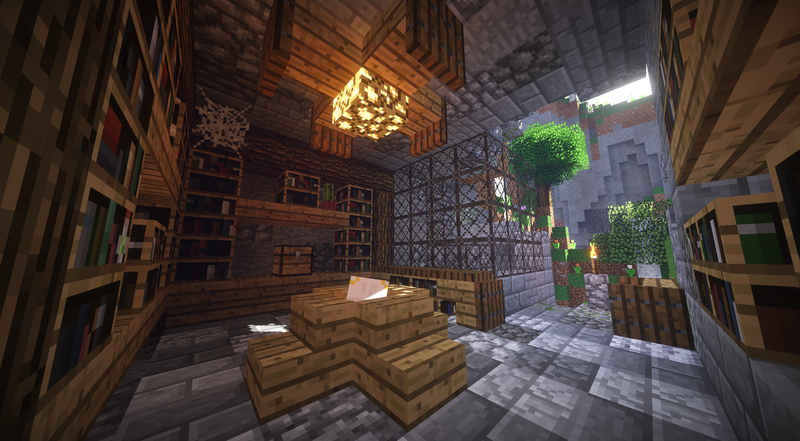 In the shelves I put a chest to stores all the extra books, along with enough lapis to 1-level enchant them. climb the surrounding hill during a rainy night to see how it looks from a distance. I like this area! At the staircase, instead of going up, we go back down again, remembering that there was one narrow stairway we had not yet explored. I just wanted to build a cave so badly, and the picture of Confucius in Rakkinishu's profile gave me the perfect excuse!! Haha! I don't know if you recall the tunnels I stumbled and hid in the closet under the Landscaper, Farmer and Grower's house? 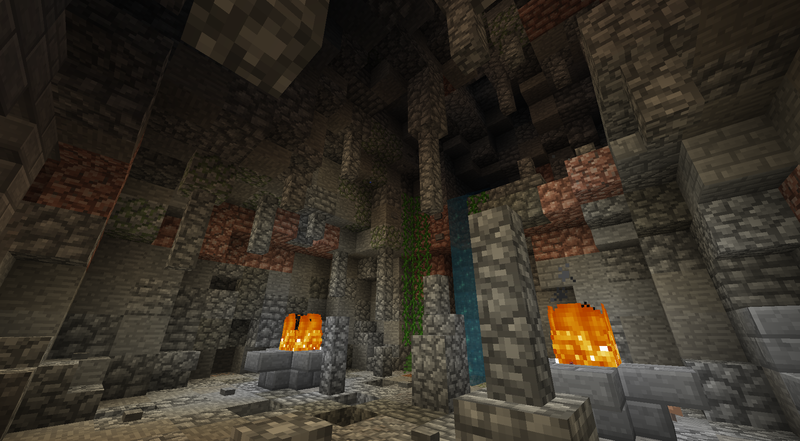 Well, these had a really nice cave which happen to be in the right direction. I go there, mark the coordinates and then dig a staircase down to it. Even before I reach it, there is a large winding shaft which I take advantage of and fill with all sorts of stony goodness! A fire pit for lighting, some railings and the stairs continue winding down! The cave is a blast to build! Stalagmites and stalactites! Dripping water by hiding pockets of water. As much cobble as I can gobble up! The cave has a sort of elevation on one side which is great to have a small waterfall running from. Mushrooms, vines and ferns all fit this humid setting. 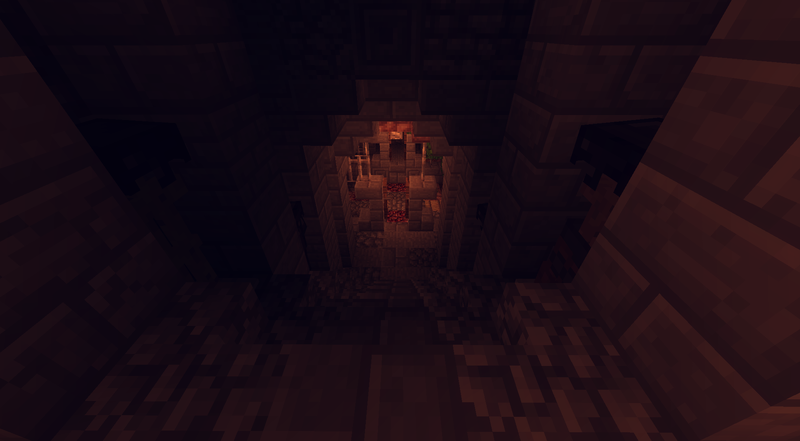 I light the cave up with nether rack on fire surrounded by cobblestone, a design I got from watching Klautos on YouTube, building an amazing goblin kingdom in Creative. 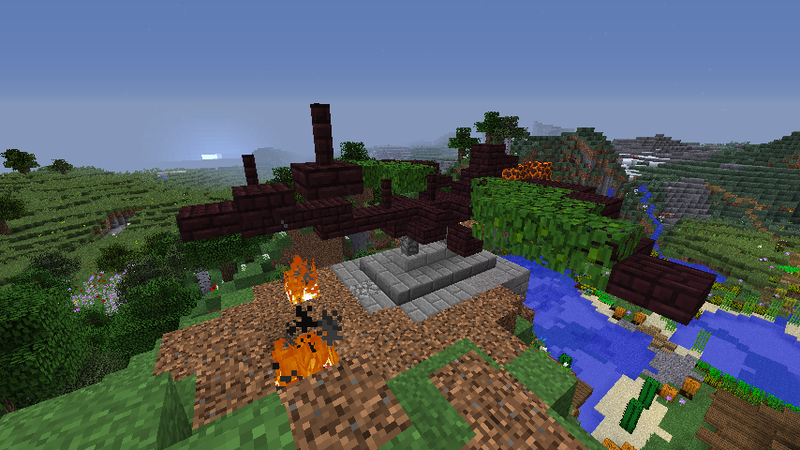 But since we are in survival, I use stone instead of wood, the smithy burning down once was enough for me. The signs all have quotes from Confucius of course =) They are not all readable in the screenshots, but they will be in the world download! Very nice, both the library and the cave. 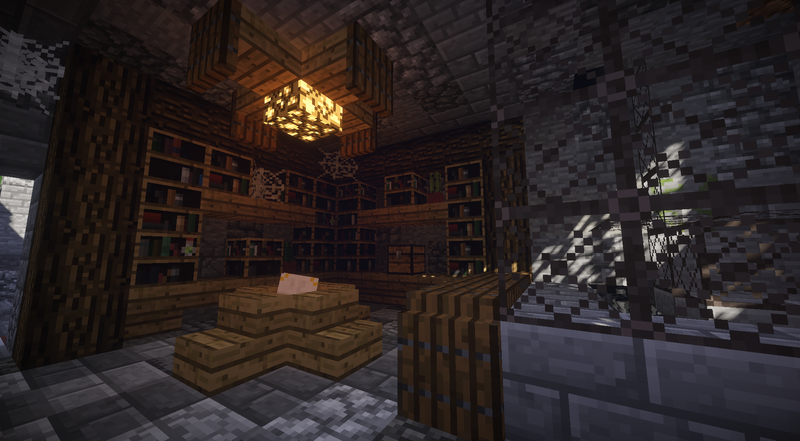 I like the enchanting table seating area in the library, and the netherrack fires to light the cave. Inspiring! Thank you pplum25 for this kind support. Knowing it inspires gives my work more meaning!! There are three sequoias in my neighborhood, I love these massive trees, they are great for hugging and sitting under! This tree leans slightly. The trunk is like a very drawn out cone. Starting with a basic plus-shaped base, I make a few attempts before I feet both aspects are well represented. The branches of the sequoia are almost straight, with a gentle drop in altitude as they evenly extend from the trunk. The lowest branches are well above human height. These are not the longest, instead the branches slightly lengthen until the middle of the trunk. Then they quickly shorten in length until the top. The changes of length are very linear. I start by creating one branch at the lowest height, and one at the middle. I then take a step back to confirm that placement, length and curves are right. 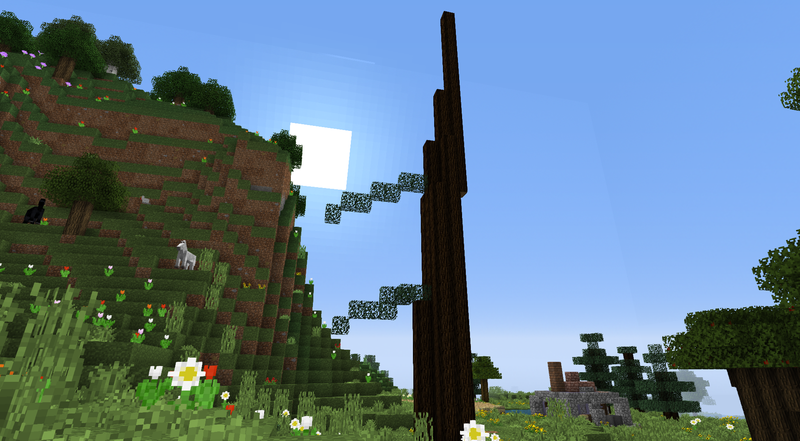 Since the top branch will only be one block long, its position and size is simple to imagine. It is therefor not necessary to add at this point. Instead we can imagine a straight line from the tip of the longest branch to a point just above the top of the trunk as a guideline to follow for the lengths of the branches. As were they positioned evenly on circles up along the trunk, the branches extend in directions alternating between each level. At each level I place four, alternating between the main compass directions (N,E,S,W), and the secondary (NE, SE, SW, NW) in a repeated sequence upward, adjusting the branch lengths to follow the guideline. Even with one level of branches at each block height, the alternation of direction gives enough room to let through light. The branches are wide at the trunk and pointy at the ends, reminding of triangular planes. I translate this to a general rule of connecting block sides more at the center than at the ends. There is this wonderful feeling standing and gazing upwards under a sequoia tree, that I wanted to convey from real life... Can you get a sense of it here? Adjacent to the first palm tree I add a smaller and simpler variety, inspired by one next to a hotel a few blocks away from my home. The last part of the Adventurer's Hub will be tomorrow, followed by Musical Crystals on Sunday, Automated Mining on Monday, an Exploration of the End on Tuesday and a World Tour/Download on Wednesday! 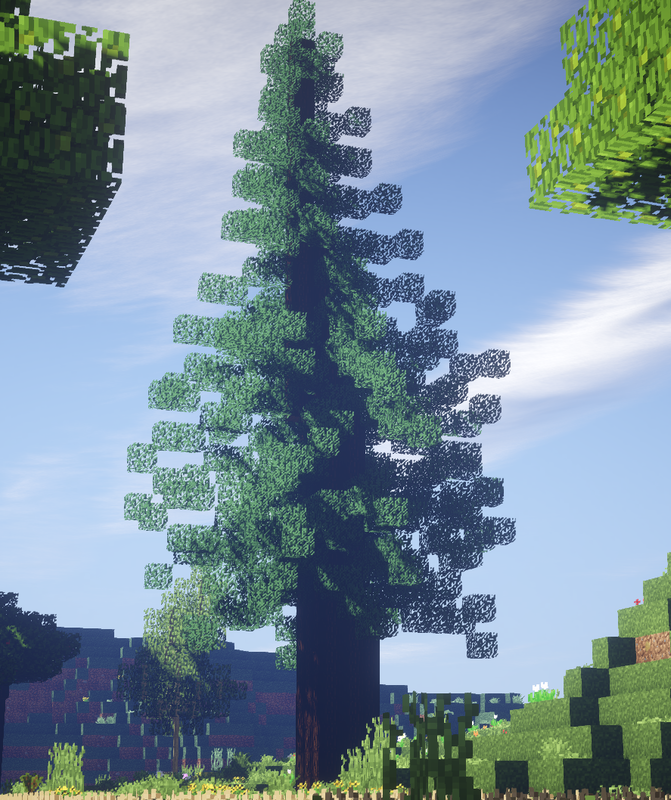 I love the trees! 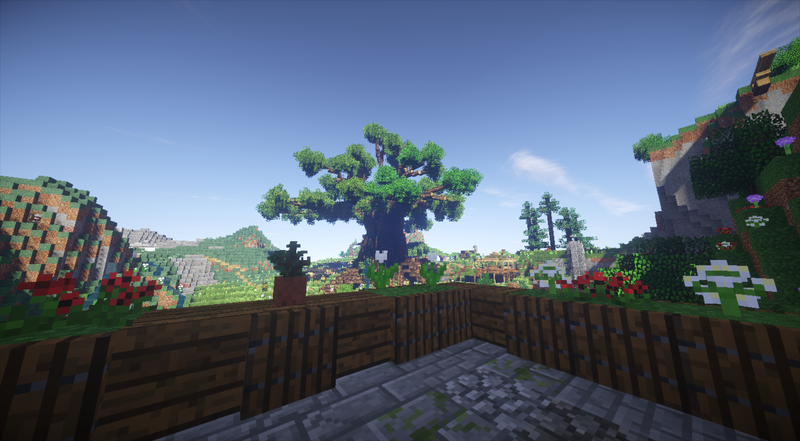 I just finished tree number 3 in my treehouse base and I like looking back at yours to give me a little inspiration. Do you make the leaves solid, or leave the insides hollow? 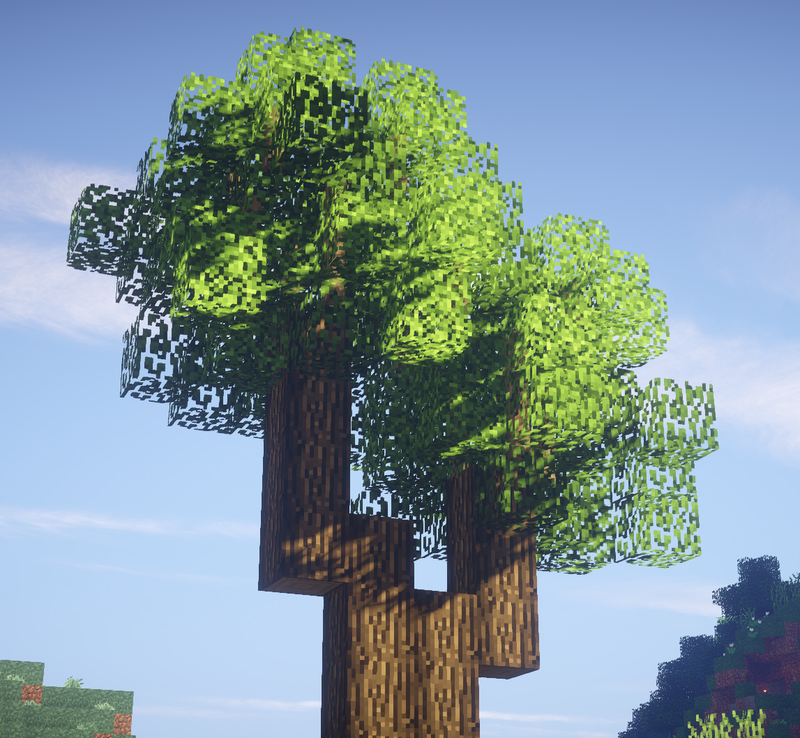 I've been trying to make my leaves, roots, and trunks look better and I wondered how you do yours. An exception to this is the Life Tree, where I used approximation of spheres at the tip of each branch. The spacing is instead between the branches. 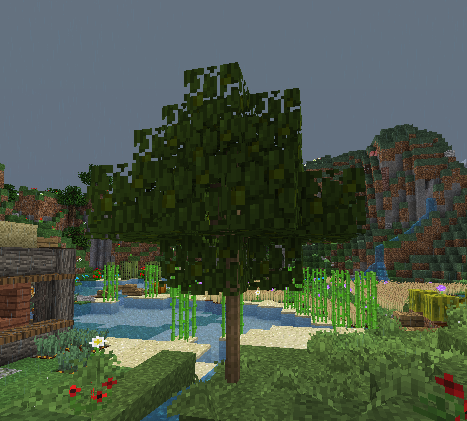 When I use fence posts to create branches the spacing comes naturally! The mangrove tree is one example. 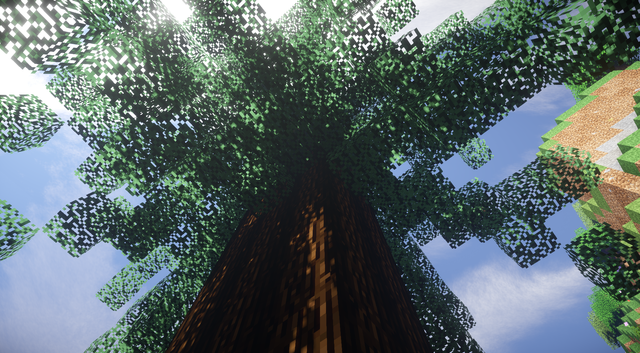 I also consider how much light is let through to figure out the density of leaves and branches. Simpler shapes can be good as a starting point. Then one can start subtracting and adding to it. I would only stop with a completely hollow or filled shape, a sphere or an upside down cone if the tree I had in mind actually had that way of growing, as with very pruned trees for an orangerie or a palace gardens. But I think wilder trees are more fun! I think few things beat observing real trees. 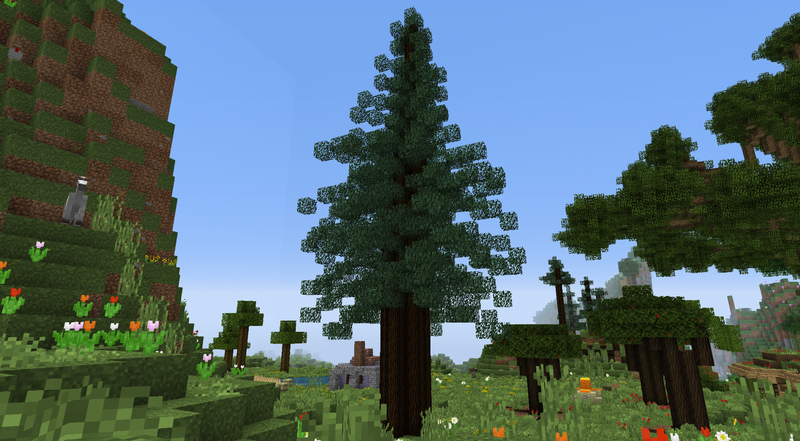 One can visualize how to recreate a tree in Minecraft while walking outdoors. To remember proportions, position, space, shapes of leaves and branches is a good practice for the memory. I sometimes do it with buildings as well, thinking how many blocks it would take to properly build an architectural feature. When using photos, it is good to have several angles;from a distance, from underneath and close. 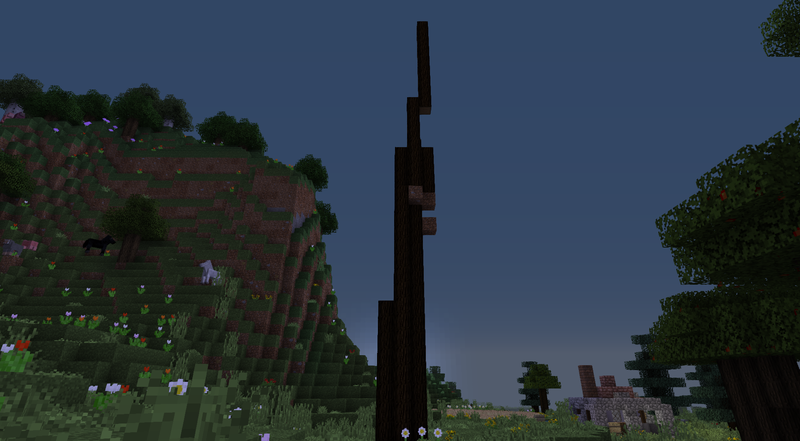 I like to use logs for the trunk, and then fence posts for extending branches, but not always. I would not like to get stuck with one method. I think it is good to experiment with items and materials and combinations one would not normally think of as related to the subject, A tree with unusual materials for leaves will be featured in one of the next posts. I dedicate the balcony to SongOfSongs, thinking that balconies are good for singing from! To build it, I use the platform that is already in place, reinforce it with stone brick pillars and spruce wood underneath. To make the place have more purpose I chose it to be the location for the 1:16 scare and 3x3 world map, using a magma block to create a soft light source. 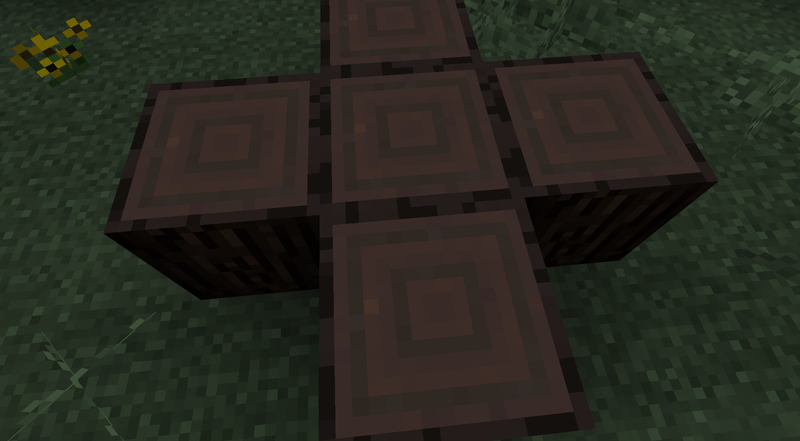 For the railings I make flower boxes with dirt and trapdoors. The opening from the Day & Night hallway make up the other wall. 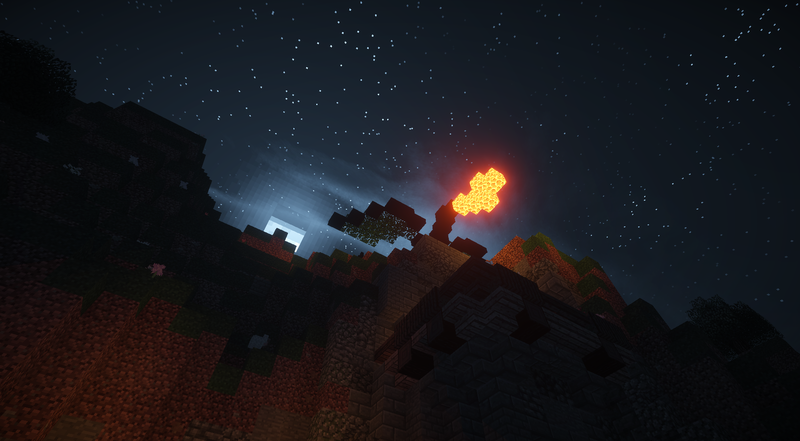 As you can see, the dragon's breath above provides some light at night. It is a very simple build, but a nice place to view the valley from! Well, there is only one option left the staircase to nowhere. There is no second floor! Then, where does it lead? 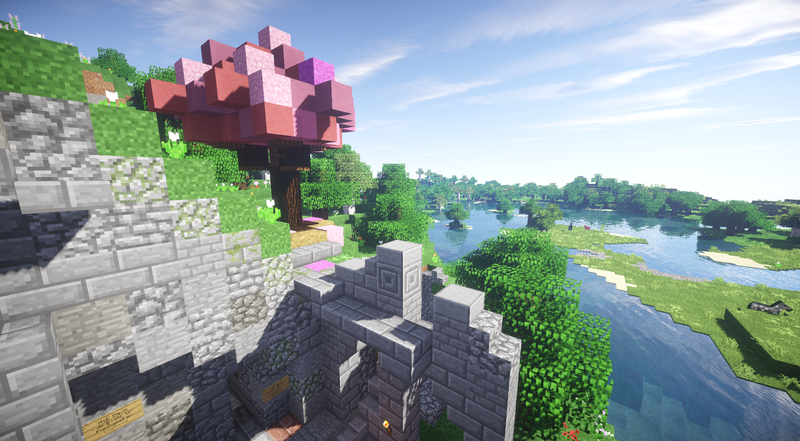 The build I have in mind dedicated to Zabarion is a partly broken staircase up to a cherry tree. 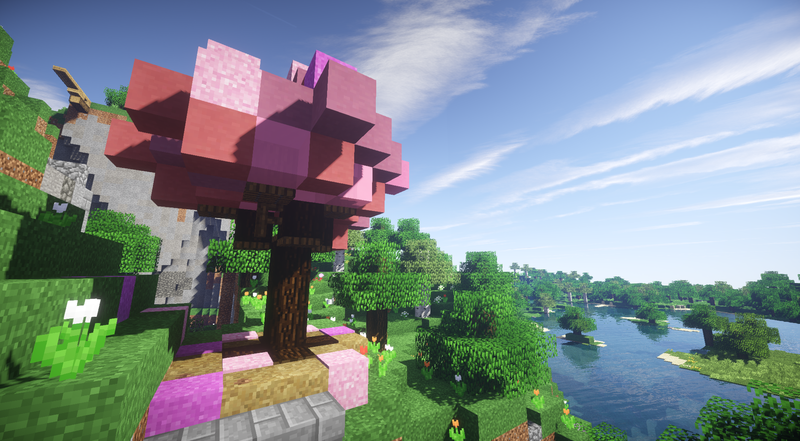 The idea and design for the tree was one of several cool things I discovered browsing the thread Axiba SMP,which Zabarion is one of the founders of. I used a temporary storage area which moved along as the different areas got completed. It grew larger and larger since each place always had its own unique materials. 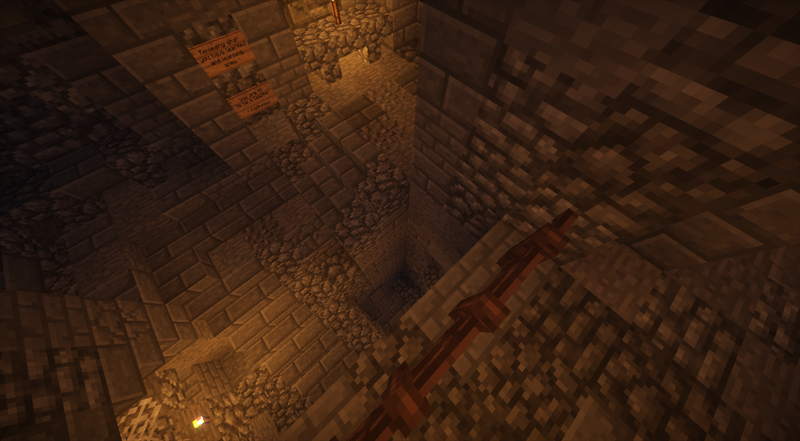 It also contains all the dirt and cobblestone from mining out the spaces. 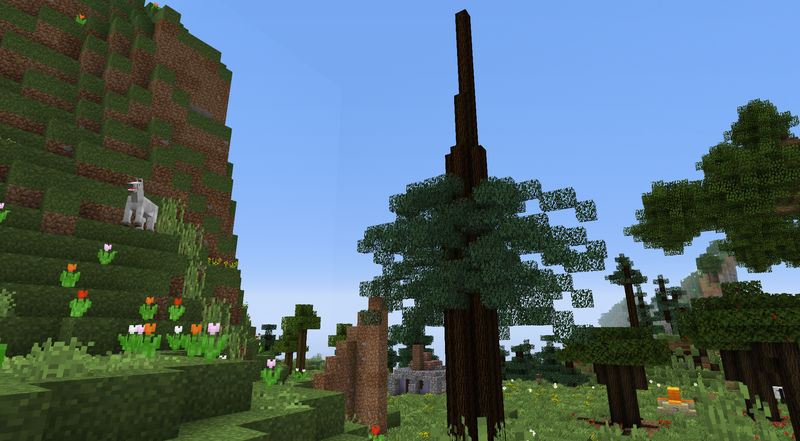 I use spruce wood logs for the main trunk and add fences in a similar way as I did in the mangrove tree for the upper branches. The leaves are a mix of magenta and pink; terracotta below and concrete mix above. Some pink glass to break up the opaqueness. 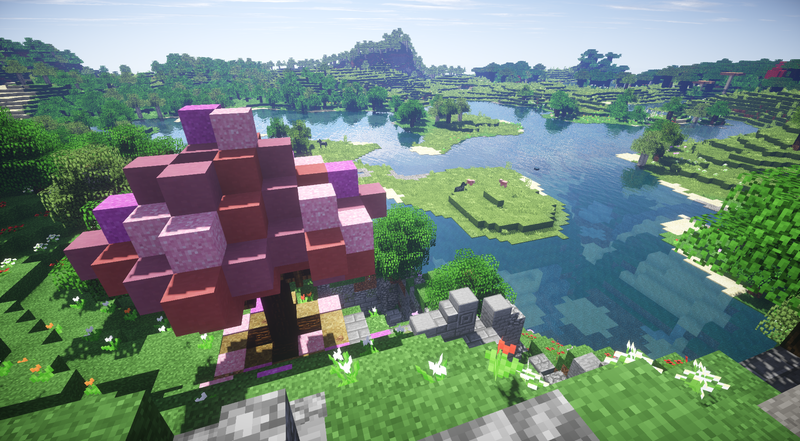 I also think replacing various dirt blocks on the ground below with pink and magenta concrete gives a nice sense of fallen leaves carpeting the ground. In fact, one could even place a few mid-air, for the real romantic feeling, like in Japanese springtime Sakuraa!! 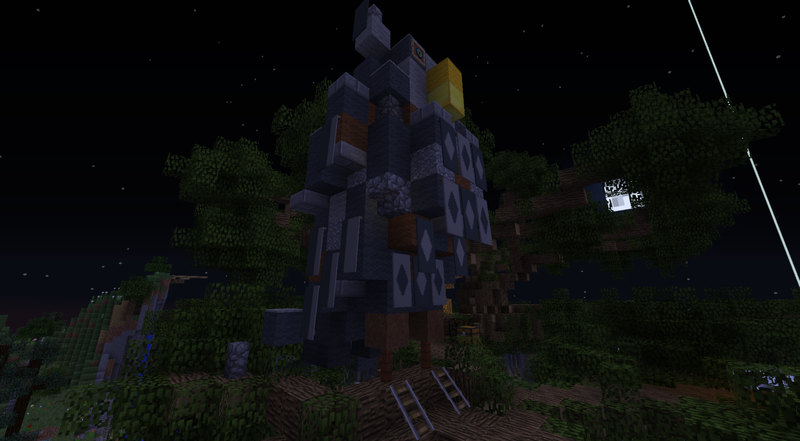 That is all for the Adventurer's Hub. 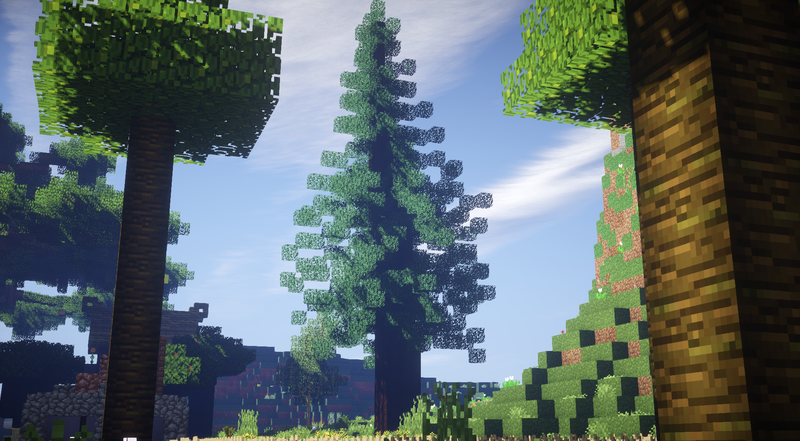 I hope you want to explore it and the world more when the world download is up, which should be on Wednesday.